A slim cascade tumbling 35 meters from the cliff edge into the turquoise waters below, the Misol-Ha waterfall makes an arresting sight, set against a backdrop of lush jungle in the Chol tribe area of Chiapas.Often visited en-route to the Mayan ruins of Palenque, Misol-Ha and the nearby Agua Azul falls are two of the region’s most popular natural landmarks. While the scenery is undeniably photogenic, the main highlight of a visit to Misol-Ha is the chance to swim beneath the falls and the deep, cool waters offer welcome relief from the muggy heat of the rainforest. A walkway also passes behind the falls, revealing a series of hidden caves that can be explored with the services of a local guide. 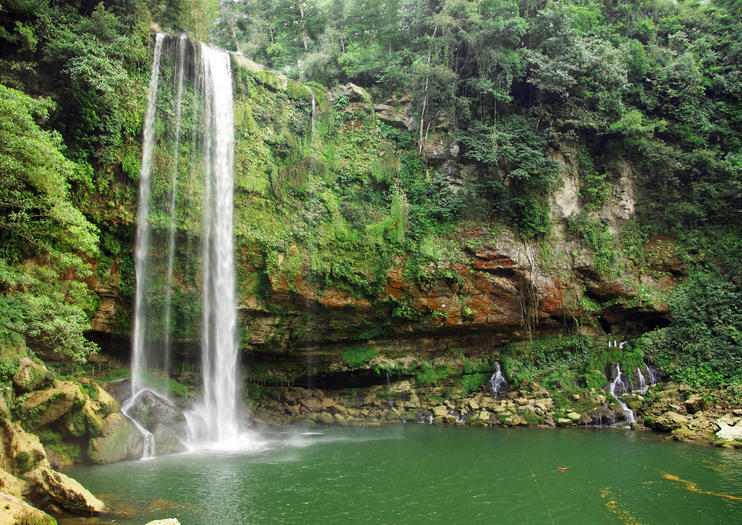 The Misol-Ha waterfall is located off Highway 199, 25 kilometers south of Palenque, and is open daily during daylight hours. Admission is 20 pesos per person. Admission: 20 pesos per person. Discover some of Mexico’s most awe-inspiring locations during this private small-group tour. Hike on foot to the base of Agua Azul for close-up views of the tiered waterfalls. A guide will be on-hand to assist you during the descent. You’ll also visit the cascades of Misol-Ha, with an option to swim in a natural pool overlooking the Chiapas rainforest. Upgrade to include lunch or the ruins of Palenque. Discover Mexico’s rich Maya past with this 5-day heritage tour. Visit Tulum, ruins overlooking the Caribbean Sea; see stucco masks at Kohunlich; and check out zoomorphic figures in the temples of Chicanna. Swim in the waterfalls of Misol-Ha, visit an ornate tomb in Palenque, and marvel at the rounded pyramid of Uxmal. Learn about the Maya peoples’ incredible understanding of astronomy in Chichen Itza before your tour concludes. Get an early start to a full day of sightseeing at Cascadas de Agua Azul, Misol-Ha Waterfall and Palenque, a UNESCO World Heritage site. Take in the natural splendor of a series of cascading waterfalls and dip into turquoise pools below the 115-foot-tall (35-meter) Misol Ha. Then visit the restored archaeological ruins of Palenque, a former Maya city-state dating back to the 7th century. Round-trip transport is provided from San Cristóbal de las Casas. Visit one of Mexico's most enchanting Maya sites on a full-day tour from Tuxtla Gutierrez to Palenque, then continue to two gorgeous waterfalls in the Chiapas highlands, Misol-Ha and Agua Azul. You'll see mountain scenery, ancient pyramids, and turquoise pools, with 2.5 hours to explore Palenque alongside a local guide. Learn the stories behind the stones as you tour the UNESCO-listed archeological site, whose elegant architecture has a dramatic backdrop of steep jungle. Visit the stunning waterfalls of Agua Azul during a full-day tour that includes one-way transfer from San Cristobal de las Casas to Palenque. At Agua Azul, you can go swimming at the falls (weather permitting), or walk to additional falls nearby. Afterward, continue to your choice of either Misol Ha—another impressive waterfall, or the National Park of Palenque—one of Mexico's top sites for Mayan ruins. Along the way, you'll pass through the Lacandon rain forest and learn from your guide about the history of Chiapas.